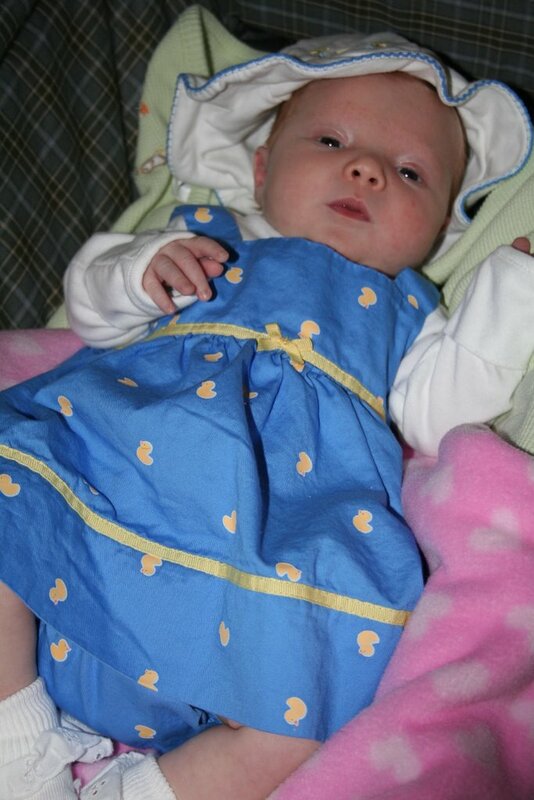 Here are some cute pics of the ducky outfit from Aunt Kim and Uncle Mark and Bridget hanging out with Riley. To view the rest of Bridget's September pics, make sure to visit the collection: delanty.shutterfly.com! Well, we definitely have a good eater on our hands! She's not too big, just over the 60th percentile, but definitely on track. Everything else at the Dr's was great. While she still likes to be entertained almost constantly and seems to get bored easily (something to which my mom replied, "hmmm, wonder where she gets that") we are definitely getting more used to her needs and her demands and hopefully meeting them a little bit better. Luckily, she is great at night. She knows when to go to sleep and gets up to eat once or twice and then goes right back to sleep. Now if I can only learn to go right back to sleep, we'll be in great shape! That's all for now, the little one will be waking shortly and I need to get some work done before then! I like to keep it interesting so we got a new blog template today. I don't love this one, but it will work for now. Bridget goes to the Dr. tomorrow for her 4 week checkup. I'm guessing she weighs over 9lbs. She is a great eater like her mom and dad. I hope she doesn't have to get shots, but I bet she does. I told Aimee I cry when my dogs have to get shots, so I can only imagine what this will be like. I wish I could get them for her as I don't mind getting shots at all. Otherwise, she is still a little fussy these days (although not as much when she goes to Grandma and Grandpa J's.. so she goes there a lot!) and doesn't like to sleep during the day very often, but at least she doesn't cry for extended periods of time anymore. Luckily, she does like to sleep at night for at least three hours at a time so that makes my life a little easier. I'll post some pics of her in a cute dress that Aunt Kim gave her later today. Oh, she also helped cheer me onto victory in fantasy football yesterday and this picture is of her in her "Team Mommy" shirt. It's bad quality since it's from my cell phone, but I forgot to take one with my good camera. The little circle at the bottom says, "1-2-3 Webmasters". Webmasters is my FF team name and 1-2-3 is because my husband is a weirdo and always said that at volleyball games as our rally cry. Well, that's all for today. I'll try and post more after the Dr's appt tomorrow. A quick week 3 update finds us doing better. Bridget has settled in a little better and maybe the medicine that we got from the Dr. helped, too. The crying has definitely lessoned and while she still has her moments, we can definitely handle them! She is sleeping better and likes to lay on her stomach and practice lifting her head. She still doesn't really like car rides all that much, but I'm hoping that will change as I like to cart her around during the day. 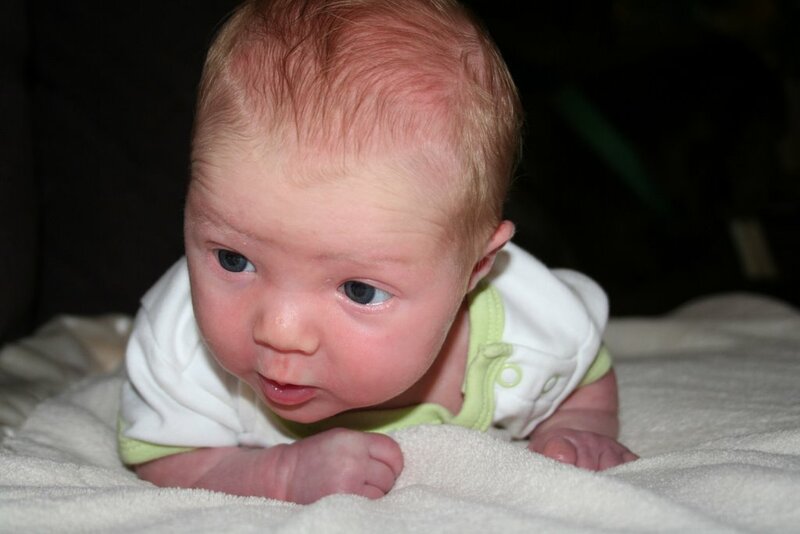 Here is a picture of her holding her head up from a couple of days ago. Well, as much as we expected a little spitfire of a baby, the 6-8 sometimes even more hours of unhappiness has been a little more than we had anticipated. After a much needed Dr.'s appointment yesterday, we have learned that our little Bridget may be "colicky". The Dr. said in the past they really didn't have any treatment or course of action for babies that may exhibit "extreme crying spells" and that are basically inconsolible. 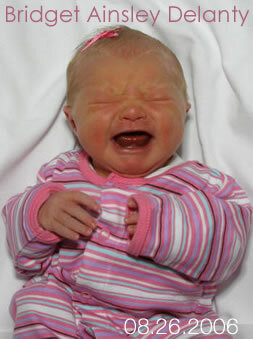 Now, though, they believe that most of colic stems from acid reflux. So, we are trying a nice little drug cocktail of mylanta and baby pepcid to try and see if that makes her feel better. So far today she has slept more of the day, although still seems to only want to cry when she is awake. Regardless, sleep is a step in the right direction as yesterday she was awake from 8am until 10pm with only about 45 minutes of dozing off. She needed some rest and her parents do, too! On another note, I can't wait for Lynn and Brian's wedding this weekend! Not only selfishly for the much needed night out, but just also because we are so excited for them. We love hanging out with them and wish them the best of luck this weekend! Congrats guys! That's all for today. I'll check in soon! Well, we are finally getting settled and have learned that Bridget likes a pacifier and needs a little help getting to sleep. We've had some rough nights with 0 hours of sleep, but she's also let us sleep for 4 hours at a time other nights, so we're working towards a happy medium! I have finally posted the pictures of her entry into the world as well as many of the visitors that came to see us. Apologies to Aunt Carol and Uncle Don, Phyllis, and Lisa, Sheryl and Ronnie as I somehow didn't snap pictures with them! TPD was the official photographer, so unfortunately, when he was gone, I wasn't good with pics! Anyway, you can check out the pics at delanty.shutterfly.com. I just can't say thank you enough for the gifts, cards, dinners and prayers of everyone. We are so lucky and so is Miss Bridget to have you all in our lives! I will get around to personal thank you's soon, but I might need a couple more good night's sleep to begin tackling those, but I want you all to know it does mean so much to us all! Thanks and much love until the next update! She's here! It's official! We have a beautiful baby girl who, as you can see, enjoys mostly not sleeping when mommy and daddy want to and screaming. 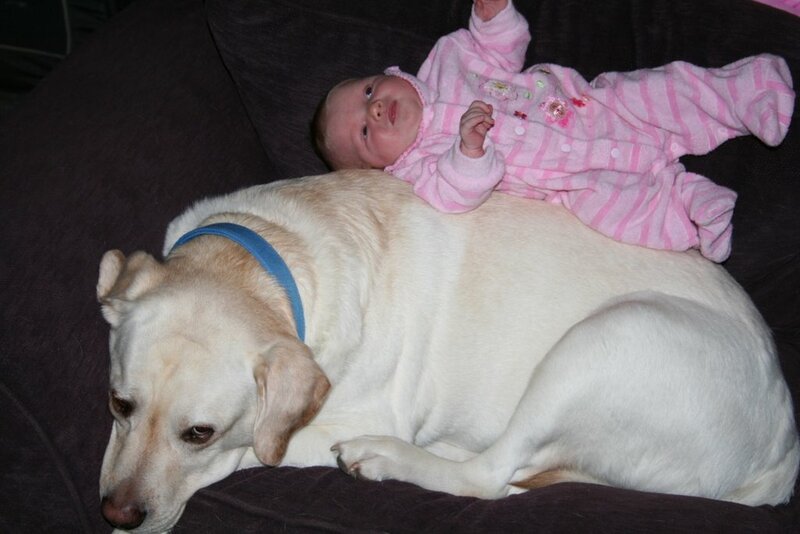 Yup, just about exactly what you would expect from our first child! While we are all still trying to adjust to lack of sleep and constant crying bouts, we love her more every minute and are happy to be home. The boys, however, may have something to say about that as they are not too sure about all this crying business! My pictures will be up shortly as I am still sorting them and pairing them down. Even I don't want to look at 200 pictures of hospital and c-sections. So, I will post those on the blog when they are available also. Thanks again to all of you for your cards, gifts, love and support through this. We know our baby girl is loved so much already, as are we!